A selection of Ella Mae Morse vocal arrangements for solo vocalist with big band. Who was Ella Mae Morse? Born in Mansfield, Texas, she was an American singer. She was also one of the most most talented and overlooked vocalists of the 1940's. She joined Freddie Slack's band when she was 17 and together they recorded "Cow Cow Boogie". It was Capitol Records' first gold single. In 1943 she set out as a solo artist and, although her records were solid and sold fairly well, she never attracted a huge following. Her voice was so versatile that she never truly fitted a single musical category. She could sing jazz, blues, rock, almost anything really. 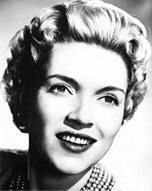 She retired from recording in 1957 but continued performing in clubs across the country. She passed away in 1999 and has a star on the Hollywood Walk of Fame. Which charts was she famous for? Most of her big band hits were with Freddie Slack and his Orchestra. We only have a few charts to offer you at the moment and we will look to add more in the future.